Brian Thacker Travel Writer | Getting on the piste. According to the Guinness Book of Records this run, at 15 kms long, is the longest marked piste in the world. I did this on my second ever day skiing out of Australia and it was such an amazing experience (the most amazing part being that it was about the total length of ALL the ski runs on any Victorian ski resort). It took us (I was skiing with a bunch of Aussies I’d met) three-hours to do it – although a bit of of that time was stopping half way for a refreshing ale. The run went from wide-open piste to skiing through a forest, down country lanes, through sleepy villages and ending up at Kublis train station where you jumped on a normal train back to the town of Davos. 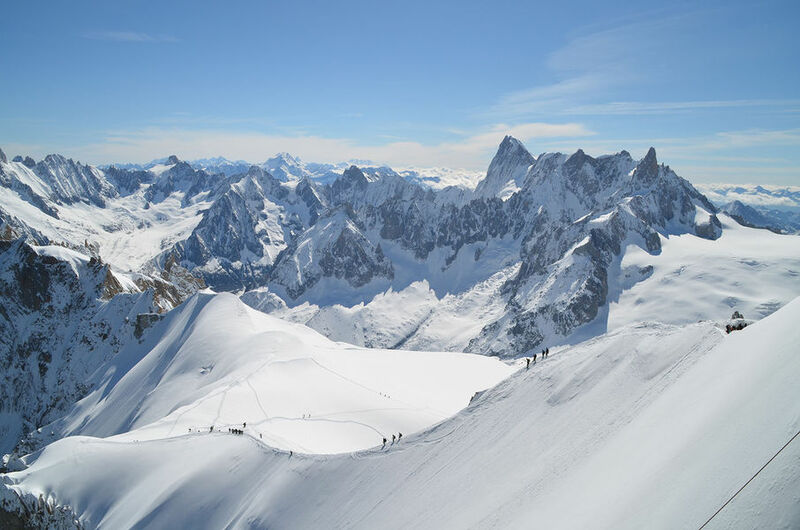 The Vallée Blanche is a 20km off-piste route that starts at 3812 meters on the Aiguille du Midi and drops 2,800 metres through amazing scenery past giant walls of ice, giant crevices and with Mont Blanc towering over you. You really need a guide (or you could fall in one of those giant crevices) and even with one you almost wet your pants before you even start. Before you even put your skis on there is the infamous arête (a ridge) from the cable car station where you are roped together with your guide (if one goes we all go). You have to clamber down, skis and poles in one hand, hanging on to a guide rope with the other, for about 100 metres, with sheer drops on either side. People fall off this ridge and die each and every year – once you slide it is goodnight Vienna. The actual run after was easy in comparison – even skiing over tiny bridges over huge chasms and over the the Mer de Glace, which means Sea of Ice and in parts was sheer ice. Heading down that scary ridge! Saustal isn’t a ski run. It’s not marked on any map except on the summer hiking map (which is marked as extremelydifficult). It’s not easy to get to, either. I did this ‘run’ with Chris Von Allmen, a local fellow who had been skiing this area for 50 years. 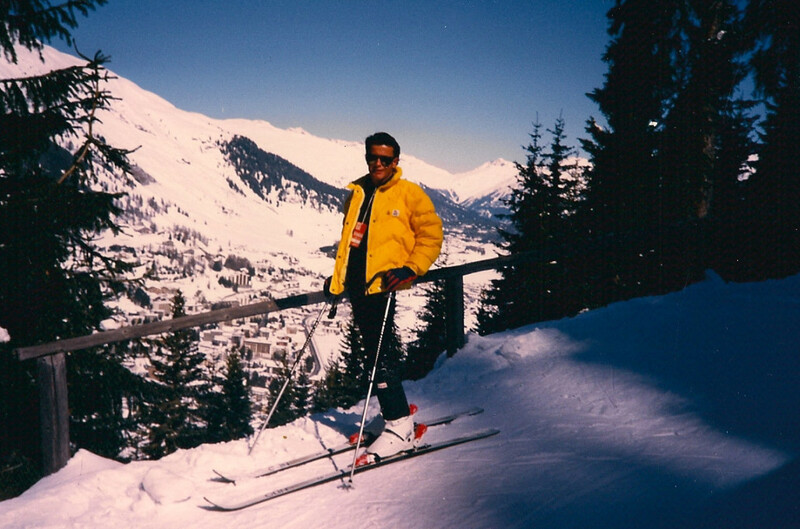 He offered to take me and my boss from London (I was working as a ski guide in the Jungfrau Region) on an ‘adventure’. 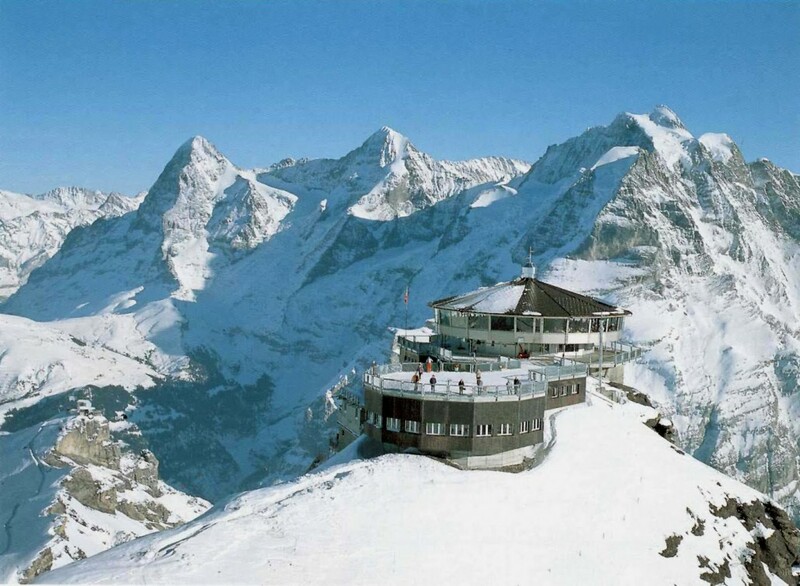 The adventure began at the top of the Schilthorn (Blofeld’s evil headquarters from ‘On her majesty’s secret service’). And it wasn’t just popping on our skis – we had do clamber over a fence then walk along a narrow ridge (another one!). Then we dropped down into Saustal (a wide, long valley) and skied for over two hours through virgin untracked snow without a single person in sight. You could have only done this with a local who knew every inch of the valley. We ended up in the town of Isenfluh where Chris’s brother-in-law Henry was waiting at an outside cafe with large mugs of beer for us.. The ridge we walked along, and on the left side is Saustal. I’ve heliskied five times now, and although they have all been simply amazing, you can’t beat your first time. A helicopter takes you from the valley floor then climbs and climbs and climbs into the heart of the range then dumps you on the top of a mountain peak. When the chopper flies off it is total silence and there is untracked deep powder snow as far as you can see. There was only four of us (three punters and a guide) on my virgin outing in virgin snow and I have never hollered so loudly or joyously as when I dropped down into the first of five verrrry long runs for the day. When you got to the bottom the helicopter would pick you up and take you to the top of another mountain peak. Even the lunch was spectacular. At one point the helicopter landed and I got up to get out and the guide motioned for me to sit down and threw out a large box in the snow. 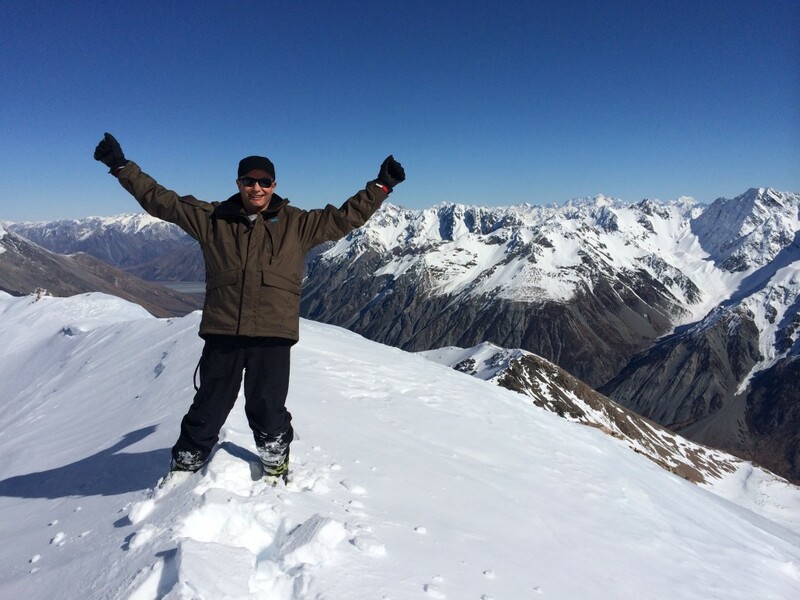 We then took off and landed on another peak and skied down until…we came upon the big box. Our guide then proceeded to dig a hole in the snow and made a table. Out of the box came a table cloth and plates of huge prawns, roast chicken, hot soup, salads, rolls and a big chocolate cake. It was the best restaurant view I’d ever had and at place at that time it was the best meal I’d ever eaten. And in less than a week I’ll be doing it all again! 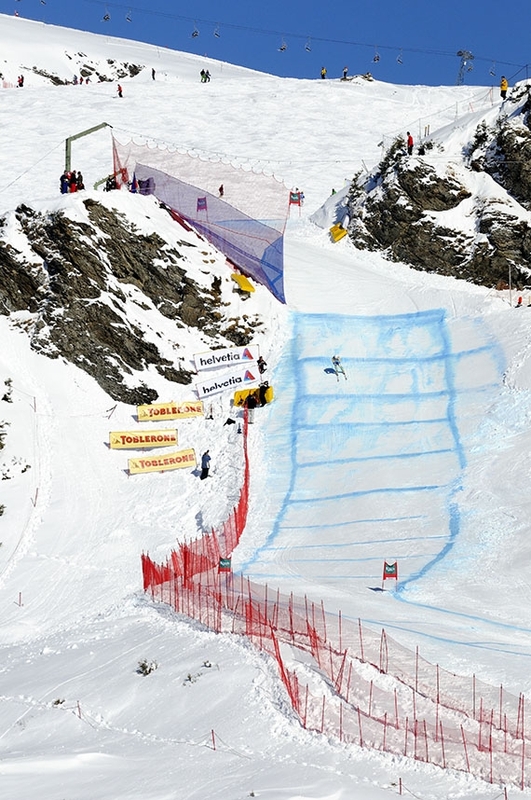 The Lauberhornennen downhill course is the longest in the world at 4.455 kms with skiers reaching top speeds approaching 160 km/h on the Haneggschuss (the highest speeds on the World Cup circuit). The Lauberhorn downhill course is also said to be the most picturesque in the world, surrounded by the Eiger, Mönch, and Jungfrau above the Lauterbrunnen valley. Another infamous part of the run is the Hundschopf, a signature 40 m jump over… well, pretty much a cliff face. I’d been down the ‘run’ many times, but one year I got to go down it the day it first opened after the race – and I’d borrowed a pair of racing skis (a very long 215cm compared to normal skis that are around 170cm). I didn’t hurtle down at full throttle the whole way (I’m not that mad), but I did go off (or more like you fall off) the Hundschopf and I did go in full tuck down the very firm and icy Haneggschuss. I didn’t quite reach 160km/h, but I would have easily gone over 100km/h. And yes I almost wet my pants and had a heart attack all at the same time. But boy, was it an absolute buzz to travel that fast with only a couple of planks strapped to your boots! Right, I better go pack my woolies (and plastic underpants for the scary bits) and hopefully I’ll see you when I get back! It was 20 years ago today… A homestay in Paradise.